Coralis Camacho Garcia moved to Florida from Puerto Rico after the hurricanes this past year. Photo credit: With permission from VoteRiders. Coralis Camacho Garcia left Puerto Rico almost a year after Hurricane Maria. 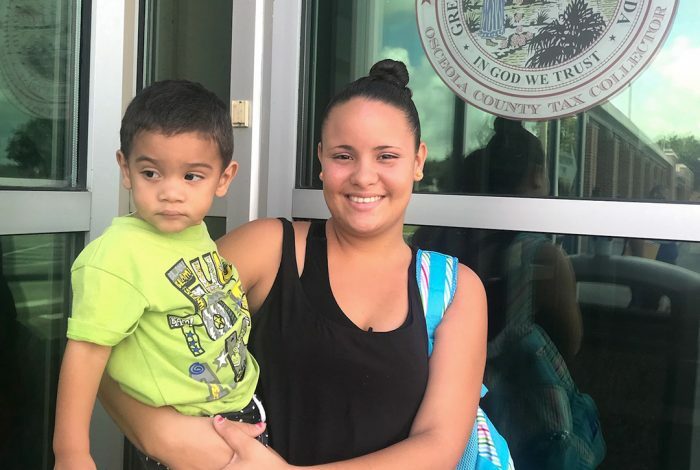 In July, she moved to Kissimmee, Florida, to find better healthcare for her children. Voting in the midterm elections wasn’t on the top of her mind — nor did she realize the effort it could take to cast a ballot. Camacho Garcia is one of tens of thousands of people to leave the island for Florida. Many of them have faced a bureaucratic nightmare as they attempt to exercise their right to vote. Unlike many people arriving from Puerto Rico, Camacho Garcia was lucky enough to have her documents in order. She still had an official copy of her birth certificate, sufficient to obtain a Florida ID. Many people either lose official documents in disasters or misplace them — and replacing vital records like birth certificates isn’t easy in the aftermath of a disaster like Hurricane Maria. She was able to obtain state identification and register to vote soon after arriving in Florida through the organization VoteRiders. 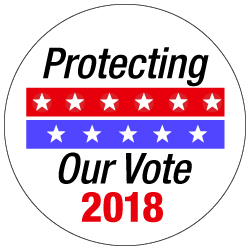 The nonprofit works to secure identification for voters who lack it in states that require proof of identity to cast a ballot. Camacho Garcia found out about the organization’s work through a family friend who works registering community members to vote. One trip to the DMV later, she thought she was all set. “The request rate is so, so high right now,” said Jazlyn Gallejo, the voter ID coalition coordinator at VoteRiders in Florida, who went to the DMV with Camacho Garcia. “It’s incredibly slow.” She explained that the fastest way to get official documents from Puerto Rico to Florida is often to ask someone still on the island to collect official records and send them overnight by FedEx. Changes in election law, like voter ID requirements, used to be subject to federal clearance under the Voting Rights Act — prior to the Supreme Court decision in Shelby County v. Eric Holder in 2013. Such shifts in standards have a disproportionate impact on communities of color, says Gabriel Sanchez, professor of political science at the University of New Mexico. Sanchez also runs Latino Decisions, a group that conducts political opinion research in Latino communities. Moreover, the state issues physical registration cards to each voter. While not necessary to cast a ballot, the card clarifies that a voter is in fact registered and contains basic information like the closest polling place, name, and party affiliation. Three months after filling out the paperwork, Camacho Garcia has yet to receive hers in the mail. She is technically registered, but the uncertainty kept her from the ballot box during the primary election in August. Right now in Florida, that means fewer people may show up to vote on pivotal issues. The November ballot includes an amendment to restore voting rights for people with past felony convictions. The current governor, Rick Scott (R), is running for Senate against Democratic incumbent Bill Nelson. Many also assume that the only valid proof is a driver’s license or state ID card. But Florida doesn’t have such strict rules. Election officials can accept a range of forms including public assistance identification, debit and credit cards, and gun licenses. VoteRiders started its Florida campaign in June. So far, progress has been slow: they’ve worked with fifty people in the Orlando area to secure identification. Gallejo says the office receives more calls each week as the midterm elections approach.